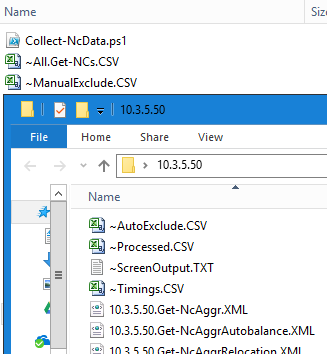 It’s very useful to collect the output of Get-NcCOMMANDs, and save as XML so you’ve got the wealth of data available via the Data ONTAP PS Toolkit at your fingertips, so you can process the XMLs (via Import-CLIXML) any way and any time you like, and don’t need to keep firing API calls at the Cluster to get information. The XMLs could even be used for configuration backup/recall purposes. The following PowerShell script collects all the Get-NcCOMMANDs possible in minimal lines of PowerShell. I added options like Manual Exclusions (ManualExclude.CSV) for things you’re not interested in, or commands that you know are slow, or commands that need to be broken up further (like Get-NcVol on large clusters). After a first run it will generate a list of Automatic Exclusions (AutoExclude.CSV), this is things that need more input (on the first run, press enter where prompted, the program will exclude these from the next run) and things that error. And there are various other outputs as detailed in the comments in the script. As always you’re going to want to test this against lab/DR boxes first. And for complete data collection, we would need to run additional Get-NcCOMMANDs (especially for those commands which require Vserver context - this will be in part 2). # N.B. AutoExclude.CSV is created on first run. Press enter where prompted for more input. # If you terminate early, remember PS> stop-transcript! # This works on the simple principle that successful data collection sees an INFO_ following an INFO_.